Shipping pallets are a highly coveted material among DIYers, but finding them can be a tricky business. Learn where to score cheap, quality pallets for your next project with these easy tips. The foundation of many furniture projects—like crafty wine racks, whimsical swing chairs, and elegant daybeds—relies on old-fashioned elbow grease and a pile of shipping pallets. Durable, versatile, and affordable, pallets are a must-have in your workshop, should you need to know where to find them. 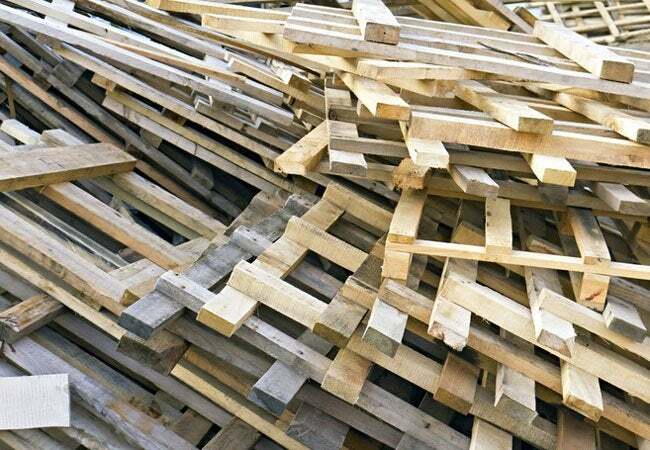 While you can order shipping pallets online, plucky DIYers seeking a bargain may be more tempted to upcycle shipping pallets found in dumpsters or lumberyards. 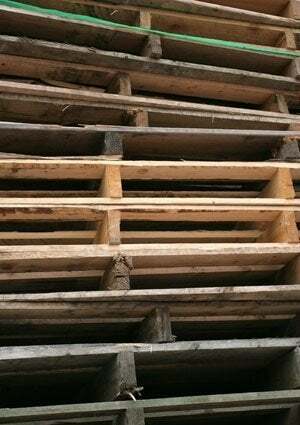 These innocent-looking pallets may seem like a DIY treasure trove, but they could be unsafe to bring into your home. To find the cleanest and cheapest pallets, consider these tips. • Skip large commercial companies that may house contaminated pallets or have disposal practices already in place. Instead, frequent small businesses like nurseries or gardens, hardware and power equipment stores, furniture stores, and neighborhood construction zones. These sites regularly receive a steady supply of clean and safe pallets that they’re often willing to unload for free if you ask. • If a new storefront has opened up in your town, consider swinging by and inquiring with them as well. Oftentimes their influx of product has arrived via shipping pallets, and they would be happy to donate some to your DIY cause. • But remember, never take what seems to be a freebie without asking! Some companies are charged for unreturned pallets, so always check first. • If the places around town fail you, you can always scour Craigslist for users who are looking to get rid of their stash. Before you commit to a pickup, keep in mind that not all pallets are equal: Some may contain splinters or nails, be tainted by food or fungus, or have been treated with harmful chemicals. Always check for the International Plant Protection Convention (IPPC) logo, which certifies that a pallet has been heat-treated or fumigated to prevent the spread of insects or plant diseases. Unstamped pallets may or may not be safe to use; don’t risk it. Heat-treated pallets (marked “HT”) are safe to use, as are debarked pallets (marked “DB”). Ones marked “MB” have been treated with methyl bromide, a highly toxic pesticide—not something you want to use as your building supplies. Select the stamped pallets that appear sturdy enough to support your future DIY endeavors and, ideally, were made in the United States (an abbreviation indicating the country of origin should be on the IPPC stamp). Once you’ve confirmed that a pallet meets your standards, take it home and get to work!